4,5 - 5.........Guys Hilo vom Norden Stamm. 4 - 5............Chico von Forell. 1999: 70-94-82 = 246 points (23rd). 1999: 98-90-15 = 203 points (30th). 1998: 98-96-98 = 292 points (1st). 1997: 32-92-94 = 218 points (20th). Pania von der Heerstrasse was the winner of the D.V. 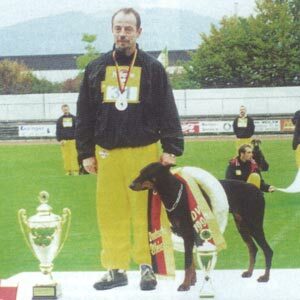 Meisterschaft in 1998 with 292 points. Her sire, Gero von der Mooreiche, was vice D.V. Leistungssieger in 1992 & 1996 and also passed the Körung with highest rating for hardness and working drives.